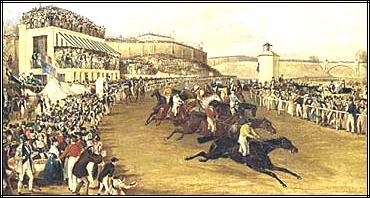 Cardinal Puff (by Pantaloon) winning the Tradesman's Plate at Chester in 1839; there is now a Cardinal Puff Stakes at Chester. Robert Colton, writing in 1850: "The course is a vile libel upon the term hippodrome, being neither more nor less similar to running round a plate, so circumscribed is the ground, and dangerous to a large field. But for fun, frolic and jollification, I know no place like Chester..."
Chester is one of the oldest racecourses in England, with records of racing there dating back to 1540. The course is England's tightest track, left-handed, and just over a mile in circumference, ensuring that horses are racing on the turn throughout the race. In the Chester Cup the runners have to pass the stands three times. The race dates back to 1824, and in the 19th century attracted a volume of ante-post betting second only to the Epsom Derby. Famous stayers to have won this event, the prize for which includes a 'Cheshire Cheese,' include Brown Jack and Sea Pigeon, the latter a dual winner in 1977 and 1978. A relatively new sprint race that was originally run in November; however, with soft ground and foggy conditions often prevailing at that time it was wisely switched to early September in 1979. Prior to 1980 the race was also open to two-year-olds, and 1973 saw the only victory for a juvenile when The Blues triumphed. The race is run over a straight six furlongs, and was upgraded from Group 2 to Group 1 status in 1988, inevitably attracting a field of top class sprinters. First run on 7th May 1887 as the Great Jubilee Handicap, this was originally one of the most important handicaps of the season; the first two winners being class horses Bendigo and Minting. Among the horses to win the race twice was Ypsilanti, whose victories in 1903 and 1904 landed huge betting-coups for his connections. In the latter victory Ypsilanti conceded no less than 48 pounds to the runner-up Cerisier. Originally run over a mile and a quarter, the race was reduced to a mile in 1979. Unfortunately, the race has lost most of its former prestige and is now just a run-of-the-mill handicap. Known as the 'Pitman's Derby', a reference to the large coal mining community that once dominated this area, the Northumberland Plate is one of the most valuable 2 mile handicaps in Europe, attracting a field of the best staying handicappers.